Vibration can be detrimental to the performance of any audio system. Achieving perfect placement of your components isn’t always possible, especially in a domestic environment where rooms are rarely designed around the hi-fi. Airborne vibrations, vibrations transmitted through the floor from the loudspeakers and even vibration transmitted through the audio rack from one component to another can all compromise the performance of a system, sometimes significantly. Naturally mechanical components such as CD players, turntables and even cassette decks are the most susceptible, but the performance of digital components and amplifiers can also suffer in some situations. The audiophile market is awash with products designed to minimise vibration. Many feet, pads and platforms exist from the sensibly priced to the ludicrously expensive. All claim to improve performance – some claims based on actual science, and, of course, a few based more on opinion and assumption than true fact. However with a little effort it is possible to construct your own isolation platforms for your components which can outperform some significantly pricey alternatives, proving that you don’t have to spend big bucks to achieve excellent results. The next step is to choose a base material. Your choice of material is important as its weight must be added to the weight of your component to choose the correct size of Sorbothane hemisphere. My intention was to isolate my Technics 1210 turntable which has a weight of approximately 12.5 KG. I chose a base material of 12 mm Corian which when cut to a 550 mm square to equal the top shelf of my rack weighs approximately 7 KG. That brought the total weight to 19.5KG, which is right in the sweet spot of the recommended load for a set of four 40 m hemispheres. A set of five 30 mm hemispheres would also have been suitable. A sheet of Corian was purchased. Though great as a turntable plinth, Corian is a hugely expensive material so it’s advisable to find an installer willing to supply an off cut. Mine was supplied by Signature Work Surfaces of Barnsley who were kind enough to cut to the final size and polish the edges, meaning no fabrication was required on my part. The sheet arrived beautifully finished in a custom wooden box to prevent any damage in transit. Packaging of this quality is something I have rarely if ever seen, and the product was delivered within a week. Service of this quality is the exception rather than the norm, and I can recommend Signature Work Surfaces without hesitation. I was surprised by the performance improvement. It’s fair to say that the isolating feet of my 1210 are a little tired; the springs have begun to sag, and they’re not as effective as they once would have been. My setup also places one speaker in close proximity to the turntable which is not ideal but unavoidable. 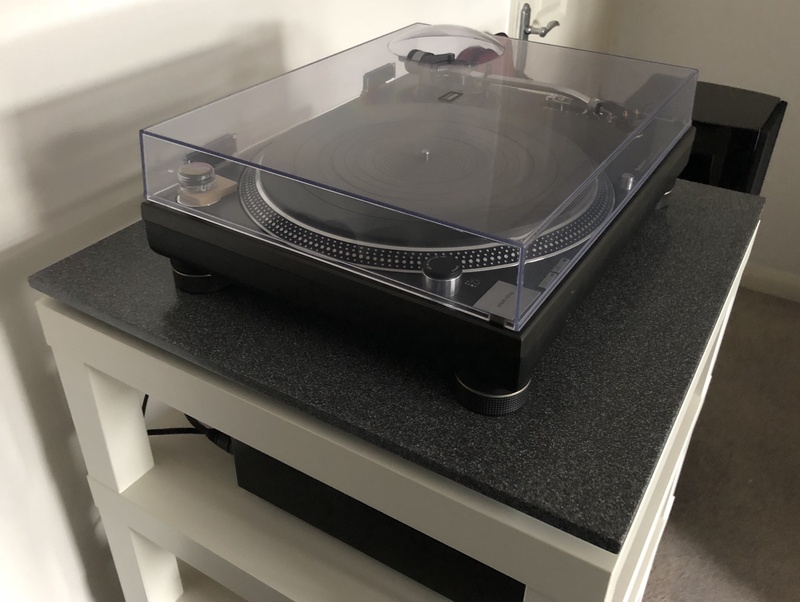 Those issues coupled to a suspended floor meant that my turntable was often affected by footfall or high volume, but the addition of an isolation platform has solved both issues. A highly recommended and worthwhile DIY upgrade that must be heard to be believed. On top of a double shelf mdf cabinet, where i store my vinyl discs, i placed four door stoppers made of solid steel. The stoppers have rubber on the bottom and felt on top. On top of them i put an heavy granite board. On top of all this sits my turntable (with damping rubber feet). I can make a wild party at home and my turntable won’t notice it. Recording studio isolation taught me that the more different materials you put the better the isolation efficiency. Also, heavy materials like granite can help a lot. That will certainly work. I tend to avoid heavier materials as mass absorbs energy which can have a negative effect on sound quality. If I had a heavier turntable I would probably consider a thicker Corian sheet or a substitute, which would more than double the weight. I wouldn’t go too far though. I have been using foam hockey pucks as isolation devices for over 20 years. They come in various densities and sell for about $3 each. If you get 6 or 12 the cost is about half that. Usually just place them directly under a component’s feet. The Corian seems like a great idea. In some cases I have used MDF in a similar capacity. I used Hockey Pucks once and they worked, but the difference between them and Sorbothane is night and day. I used a solid surface Corian substitute before for a custom turntable plinth housing a direct drive motor and cut for a Rega arm – that article might appear here one day. It’s great stuff.